In the lead-up to the federal budget on March 22, 2017 we thought it timely to share results from recent research we conducted with Canadians. There are a few critical tensions we want to highlight: First, the hollowing out of support for the ruling Trudeau Government (and we use the characterization “Trudeau Government” purposefully). Second, the central vision that Canadians have for this federal budget. And third, a snapshot into what that much-used term – “innovation” – means to Canadians. So, what about this hollowing out of support? Many have reported recently about the erosion of support for the federal Liberals, with the most recent aggregate ‘vote intention’ figure putting them just shy of 40 per cent (and on a steady decline since the fall of 2016). But this measure of support, while generally interesting, perhaps less so outside of an election cycle, really doesn’t tell us much about what the story is. Why are the federal Liberals losing steam? On the surface Mr. Trudeau seems like a popular leader, so what’s going on? In our research we decided to look into measures like ‘direction’, ‘trust’, ‘confidence’ and the Trudeau ‘brand’, in an effort to better understand the current federal political landscape. These measures, in our view, are some of the essential elements of a meaningful ‘health-check’. What we learned is that today more Canadians think the Government of Canada is moving in the wrong direction than the right one, the plurality have little to no trust in the government and the majority of Canadians have only some, or no, confidence in the current government to lead this country. Taken together this is a worrisome state of play for the government. But what is frankly even more worrisome is that their leader is now having a net-negative impact across these key performance measures. This is striking given the “Trudeau” brand only a short time ago was producing a halo-effect for the government. We tested the effect the ‘Trudeau’ name has on these measures by randomly assigning respondents of the survey to one of two versions of a number of questions; in one version we asked about “the Government of Canada” and in the other we asked about “the Trudeau Government”. We also tested this first in late 2016 and then again at the beginning of February 2017 in order to see if and how things are changing over time. What we uncovered is that on every measure we tested the ‘Trudeau’ brand yielded a more negative result. 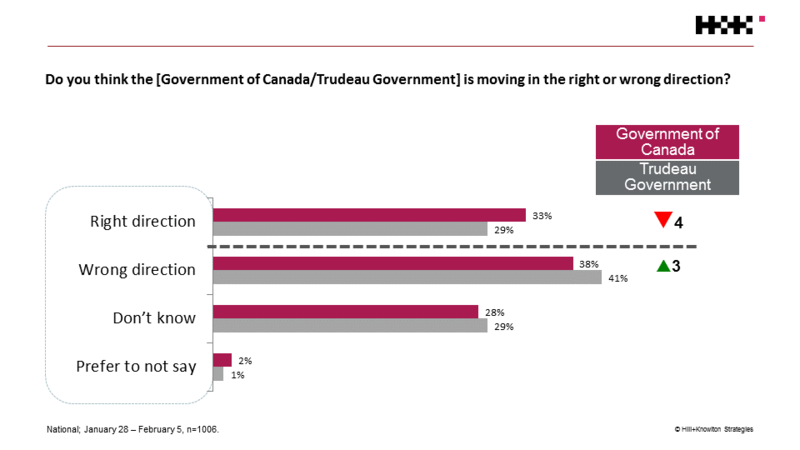 When asked if the ‘Trudeau Government’ is moving in the right or wrong direction, wrong direction was higher by 3 points (and right direction lower by 4 points). 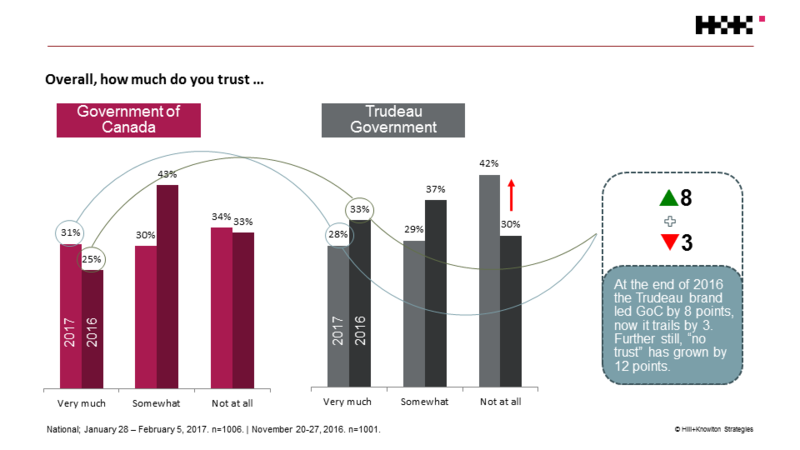 When we asked about trust, “no trust at all” was higher for ‘Trudeau’ by 8 points. 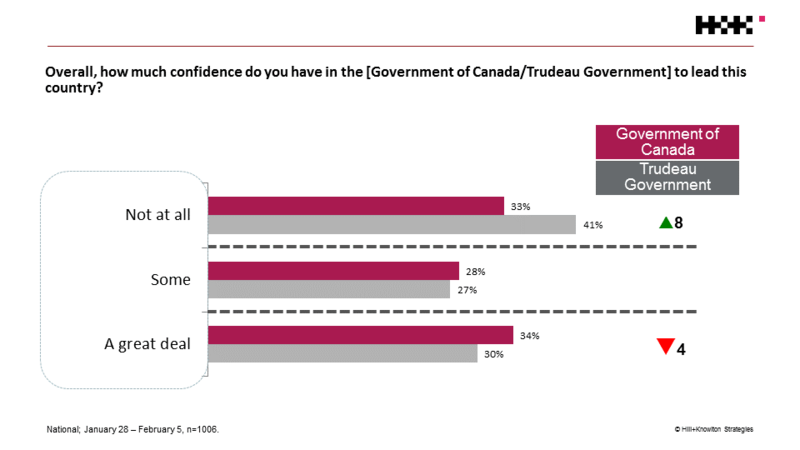 And when we asked about confidence “not at all confident” was higher by 8 points. This is in stark contrast to the results from late 2016 (we were in field in the last week of November). At that time the ‘Trudeau’ brand led the ‘Government of Canada’ brand by 8 points (it now trails by 3 points). It is our belief that what could be at play, and can at least partially explain why the governing Liberals are losing so much equity with Canadians, is that they are not demonstrating competence in the areas that matter most to Canadians. 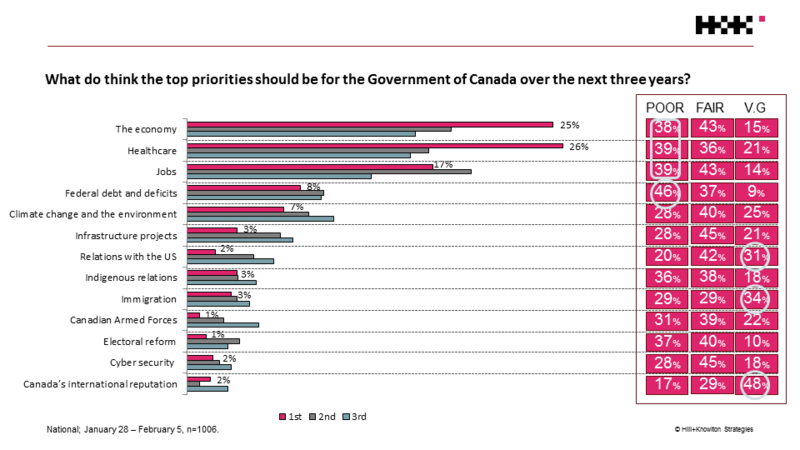 We asked Canadians what they felt should be the top three priorities for the government over the next three years. The direction Canadians are giving to the government in this research is that the top-tier priorities should be ‘healthcare’, ‘the economy’ and ‘jobs’. Among the 13 priority areas we tested the least selected were ‘electoral reform’, ‘cyber security’ and ‘Canada’s international reputation’. Next we asked Canadians to rate the government’s performance (scaled from ‘poor’ to ‘very good’) on each of those same areas. What we learned is that there is a large priority-performance gap for the government. Generally the government’s performance scores are low, but most troubling for them is they are lowest on the issues that matter most to people; their worst scores were on all of the top-tier priority areas and on the priority area of ‘debt and deficit’ (the fourth highest priority ranked by Canadians). Whereas their highest performance score is for their work on ‘Canada’s international reputation’, which happens to be the lowest priority area for Canadians among the 13 tested. All of this points to a critical misalignment with Canadian priorities. Who are the Canadians the Liberals are struggling most with? In many cases, the most vulnerable among us. Young working families, those with lower levels of education and lower incomes and those who are not politically engaged. During the last federal election the Liberal’s message about creating new jobs and kick-starting the economy through infrastructure investment spoke to these groups and brought them back into their tent. Losing the confidence of these groups, to quote Bob Dylan, must be like a “corkscrew to the heart” for the Liberals. And, the disaffection appears to be growing, rapidly, considering these groups were more trusting of the government as recently as before Christmas. For those who watch Ottawa, the federal budget is a much anticipated event, while for other Canadians it is much less significant. 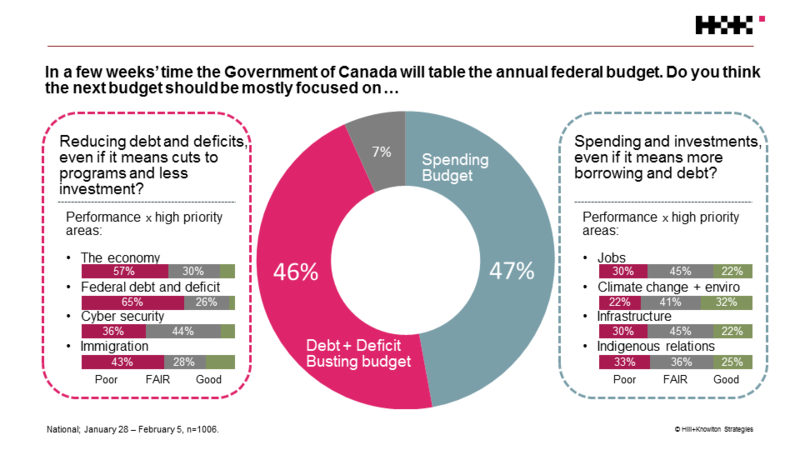 In order to understand Canadians’ preferred focus for the federal budget, we asked the respondents of this survey to pick which of the two opposing statements better reflected their own opinion: do they prefer a debt and deficit busting budget, even if it means cuts to programs and less investment, or a spending and investment budget, even if it means more borrowing and debt. Perhaps not surprisingly, Canadians are almost perfectly split, with 46 per cent favouring a debt and deficit busting budget and 47 per cent preferring a spending and investment budget. Interestingly, less than one in 10 said “not sure”. Not surprisingly, when we look back at the 13 priorities we tested, for those who favour a debt and deficit busting budget, the top federal priorities are the economy and debt and deficit. They are also much more likely to give the government exceptionally poor performance scores in these areas. For those who favour a spending and investment budget, jobs, climate change and the environment and infrastructure are seen as top federal priorities. Suggesting a close linkage between ‘jobs’ and investment and ‘infrastructure’, clearly a position the governing Liberals have been championing. The prevailing view for these Canadians is that the government performance in these areas is fair (not excellent, but also not poor). Those who favour a debt and deficit busting budget truly feel the best way to grow the economy and create more jobs is by paying down Canada’s debt. While those who would prefer a spending and investment focused budget have a dramatically different opinion. These Canadians believe the way forward on economic growth and job creation is to invest tax dollars in infrastructure repairs and builds. However, regardless of your vision for the budget most will agree a strong strategy for economic growth and job creation is to invest in post-secondary education and skills training. In terms of investment in innovation, Canadians who favour a debt and deficit busting approach are much less likely to feel that funding research in an effort to develop breakthrough technology is the way to go, compared to other Canadians. There has been a lot of talk about this budget being the ‘innovation budget’. And, perhaps this narrative has been crafted for good reason. If the governing Liberals have done their homework they will know that innovation is a safe political play. Certainly that is what our research is showing. In a world where almost half of Canadians agree that Canada can’t keep relying on its natural resources as its main economic driver (and less than one in five disagree) innovation seems increasingly politically attractive. But, what does innovation mean to Canadians? What we learned is that, for the most part, people have a more nuanced and less cynical view of innovation than one might imagine. We learned that many believe the only way for a business to survive is through innovation, and the only way to truly grow the economy is through innovation. 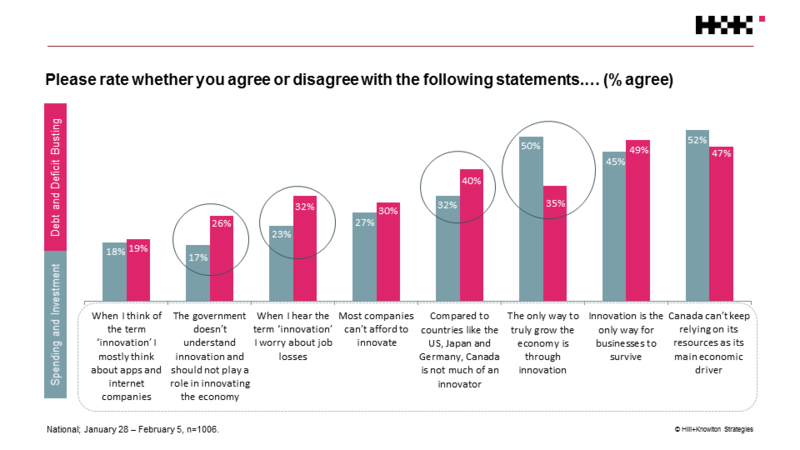 We also learned that most disagree that businesses can’t afford to innovate, and they disagree that people just think of ‘apps’ and internet companies when they think about innovation. Only a quarter of Canadians think of job losses when they think about the term innovation. 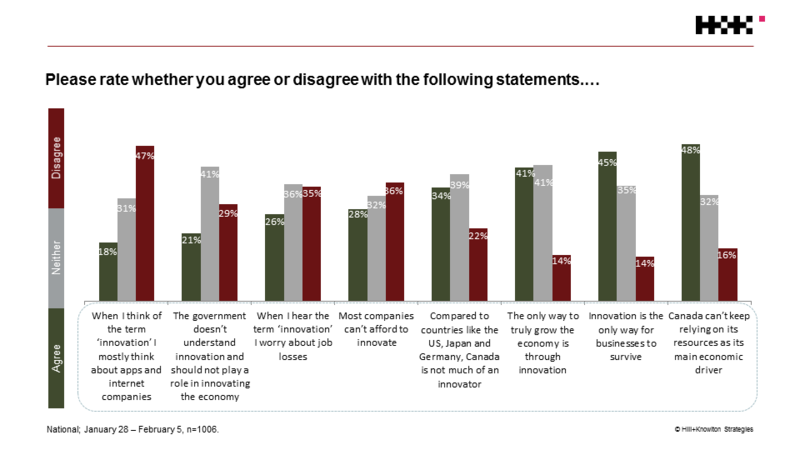 And perhaps most important for government, very few agree that government doesn’t understand innovation and shouldn’t play a role innovating the economy. Those that prefer the next federal budget be focused on debt and deficit reduction are much more likely to take the view that Canada is not much of an innovator, that government doesn’t understand innovation and should stay out of it and that innovation is really just code for job loss. But this is a product of this group feeling the Liberals are not up to the task of governing, owing to the fact they have little to no trust or confidence in the Trudeau government. However, the plurality of these Canadians agree Canada can’t keep relying on its natural resources as the economic driver and innovation is the only way for business to survive. Those that prefer a spending and investment focused budget take a more supportive view of the government’s ability to play a role in innovating the economy and are not really zeroed in on job loss as a result of innovation. But what really defines this cohort is the belief that the only way to truly grow the economy is through innovation. Taken together, our research suggests that one and a half years into their mandate, the Trudeau Government has begun to face a significant amount of skepticism and scrutiny from the public. The good vibrations that many Canadians felt in the aftermath of the election, and which were sustained by the Government’s high profile policy shifts on immigration and the environment, have given way to anxiety about traditional bread and butter issues, like jobs and economic growth. But is this the natural evolution of a new government? Certainly the hard work of governing is starting to rub the shine off a bit, but it is unlikely that it means the end is nigh. An interesting political question at this stage is would things be different if the two opposition parties were functioning as real opposition instead of being embroiled in leadership races? If what we’re hearing about the Government’s decision to focus their budget on innovation is true it could help to shore up some of the support they have been losing, particularly among low and middle income Canadians. It also seems like the smart play. Given public attitudes they’ll likely make no one really happy, but also avoid making anyone really unhappy. The survey was conducted independently as part of the ongoing issues research portfolio developed and maintained by Hill+Knowlton Strategies for insight on current and topical issues. Hill+Knowlton Strategies conducted an online survey of 1,001 adults nationally between November 20-27, 2016 and 1,006 adults nationally between January 28 and February 5, 2017. In each instance the final survey data was weighted based on census figures according to age and gender and province to achieve a representative sample of Canada. Samples of these size have a credibility interval of 3.5 per cent or 19 times out of 20. The samples for both surveys were drawn from H+K Perspectives, an online panel developed and maintained by Hill+Knowlton Strategies Canada. The methodology used to recruit and maintain the panel was designed by one of Canada’s foremost panel experts who also leads the national Research + Analytics practice.